It’s not always about how long your video is, but what you DO to get their attention! And this is highlighted by the fact that a team at Pixability conducted a study of 200,000 branded videos on YouTube – with over 50% of these videos having under 1,000 views! So what I’m getting at is the fact that despite all challenges, videos is a clear winner in being a content marketing medium that truly gets people’s attention. And with each marketing platform doubling down on its efforts to integrate and capitalize on video, now is a perfect time to take a closer look at how you can use videos to drive engagement, create a loyal following, and turn it into a growth story. People today are searching for a wide variety of videos that range from their favorite Louis Fonsi song to how their favorite boyfriend jeans can be styled (in 4 different ways)! But here’s a fun fact that might or might not have crossed your mind – consumers watch videos to educate themselves, to discover and connect with brands.These consumers want to know more about a brand, and what makes them different. According to a study by The Luxury Institute, luxury brands are defined by superior quality (73%), craftsmanship (65%) and design (54%). And a really good example of how a luxury brand is communicating that through video is Louis Vuitton, which uses the video medium to demonstrate the craftsmanship required to make each product. 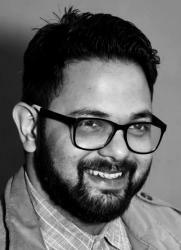 In the words of e-commerce specialist Amanda Dhalla, Louis Vuitton makes consumers “feel their money is well spent”. Louis Vuitton Showing Consumers How It’s Done! Much before the days of Instagram, YouTube, and Snapchat influencers was Twitter’s Vine App. Back in its glory days, brands like Kate Spade used Vine to not only showcase their own products, but also give their fans behind the scenes content and sneak peaks at upcoming campaigns not yet released to the mainstream media. This proved to be more personal, and relatable. Similarly, Old Spice – a brand known for their creatives, increased sales by 107%, by letting fans and followers dictate the direction of their campaigns. While you’re probably creating tons of in-house videos to communicate with your audiences, more often than not the best publicity comes from your loyal fans – in the form of user-generated video content. Nothing brings more credibility than user-generated content does. In fact, a ComScore study revealed that engagement increases by 28% when consumers view a mixture of user-generated product videos, and official brand content.User-generated videos humanize your brand and tell a story that’s more personal. Which is why it’s no surprise that user-generated content receives 10X more views than brand owned content. It’s no secret that engagement on video is still something that needs to be worked on by most brands. Even though video accounts for almost 80% of all internet traffic, over 80% online video ads are abandoned even before they reach the halfway mark. With so much effort gone into the production of this visual content, it’s important for brands to make their videos actionable. 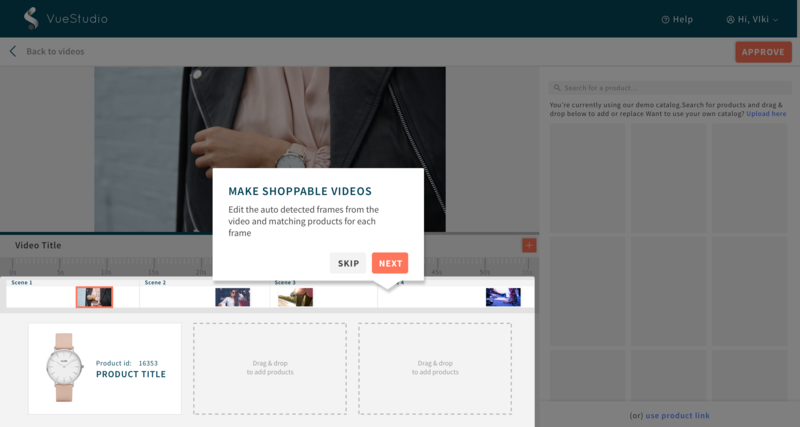 With VueStudio, you can make your videos instantly shoppable, therefore creating a direct conduit for a shopping journey (and significantly shortening the path to purchase). In fact, one of our customers reported almost 1.4X higher time spent on site browsing and shopping for products after incorporating shoppable videos. One of the most-significant challenges marketers face is casting the product as a star without selling. With the use of VueStudio, it’s possible to incorporate your product subtly into your video campaigns without being overtly “sales-y”. Make your product a star even if it’s merely a prop in a video. And the best part is, with VueStudio’s built-in analytics, you can see the results for yourself, and how your videos are performing while contributing to your top line growth. No one likes a brand that fails to follow seasonal trends or doesn’t create content that caters to specific occasions. So if your audience is going to Coachella, there’s no reason why you’d show them an edit on leather pants, right? Or outerwear when everyone’s going on spring break! Make the most of special occasions like the holiday season, or the music festival season to show video content that’s relevant. 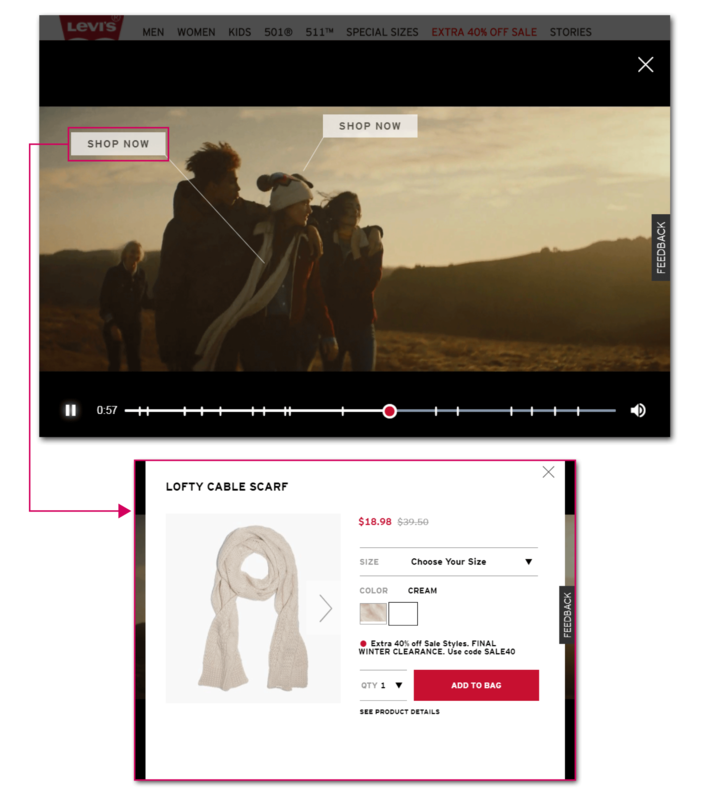 Here’s an example of how holiday season themed videos powered by VueStudio worked for Levi’s. The videos generated 63% higher interactions as they were theme-specific, and more importantly, actionable. The beginning and end of video marketing complexity lies in finding that precarious balance between engagement and compelling relevance. It’s a competitive world out there, and the only brands that can survive what I’d like to call “video-pocalypse” are the ones which will be able to not only create and curate content that is contextually relevant but will also thrive across platforms, keeping consumers engaged and loyal. These will be brands that’ll be able to turn inspiration from visual stories into purchase.